There are two big Starbucks milestones that I get really excited for: the Pumpkin Spice Latte and red cups. 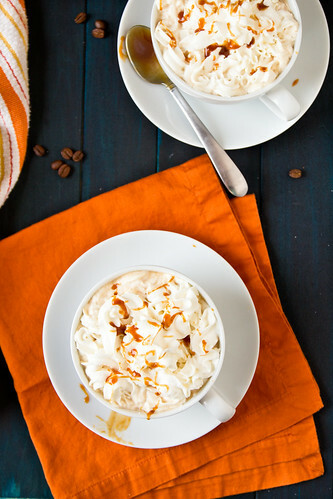 Last year, my friend Courtney made a pumpkin spice syrup that’s perfect for homemade lattes. It’s clovey. It’s gingery. It’s cinnamony. And it makes your homebrewed coffee taste a lot like Starbucks, for a lot less. It’s easy to make at home and it will keep in the fridge for quite a while. Stir a tablespoon or two into your favorite cup of coffee and top that with a little whipped cream. And you might as well go ahead and grab the jar of salted caramel sauce while you’re at it. You’ll probably have nearly everything in your pantry already for this recipe but if not, now is the perfect time to run out and buy a can of pumpkin. Or 4. Because if my grocery store is any representation, there might be a few pumpkin hoarders out there. Oh, and make sure you try it in a mug of hot chocolate. That little extra warmth and spice is magical. The best part? You do not need super fancy equipment to make this latte. Simply stir in a few tablespoons of the pumpkin spice syrup into your favorite cup of coffee! A quick and affordable way to make the coffee shop favorite at home. No fancy equipment needed! To make the syrup: Cook sugar and water in a small pot over medium heat until the mixture is completely clear. Whisk in the remaining ingredients and continue to cook for about 5 minutes, stirring frequently. Do not allow mixture to come to a boil. Allow mixture to cool for 10-15 minutes. Strain syrup through cheesecloth or a fine mesh strainer into a large jar or bottle of your choice. Keep syrup in the fridge, it will last a nice long while. To make the latte, combine strong-brewed coffee or espresso with the milk, and stir in pumpkin spice syrup to taste. This is brilliant! Love this idea! I love your addition of salted caramel sauce and will definitely be adding that next time I make one. Ahhh, red cups! Can’t wait. Ok, *maybe* I can, and this syrup will definitely be helping. Thanks, Shawnda! How long will the syrup stay good for in the fridge? I can’t wait make this! This looks and sounds delicious!! Amazon.com has canned pumpkin. Can you get it shipped internationally? It is not too hard to make your own pumpkin puree as well. You basically cut a pumkin in half, remove the seeds, bake till tender, scoop out of the shell and blend the pumpkin flesh. Voila! Pumpkin puree ready for your latte recipe! well, this looks delicious!! I just can’t get enough pumpkin spice during the fall! OMG! I was just talking to a friend yesterday about making my own pumpkin spice syrup since Starbuck’s pumpkin spice syrup contains dairy. Thank you!!! I have all the ingredients except the cinnamon sticks. How much ground cinnamon should I use for a sub? Thanks! Mandy – 1 Tbsp should be good! 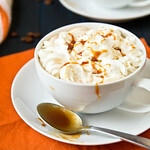 I don’t drink coffee, but I’ll take a big pile of the whipped cream and salted caramel sauce please! Pumpkin spice lattes are one of my favorite things ever. The weather is finally starting to get a bit chilly here so pumpkin stuff is in full swing at my house. Thanks for sharing this! It looks great! I have approximately twenty cans of pumpkin on my shelves. There are SO MANY lattes in my future. There used to be a day when grocery stores would keep at least a can or two of pumpkin on the shelves during the off season. Not anymore! I might end up being one of those hoarders. This is a great idea! Reading this post just made my day. My week. I cannot wait to make this! OMG! Such a yummy and beautiful site!!!! Too bad we couldn’t smell it!!!! Confession: I’ve already had 2 Pumpkin Spice Lattes from Starbucks! That’s the only way to kick off the fall season! I tried their new Salted Caramel Frappacino this week too. OMG! I could have just had a bowl of the whipped cream topped with salted caramel!!! It was SO delicious!!!! Looking at that photo just made me smile! 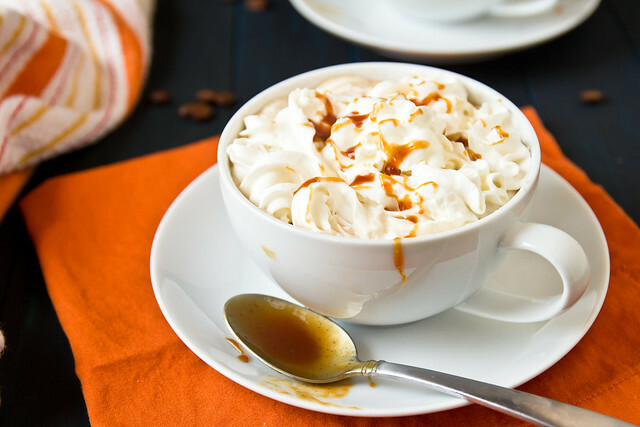 I just got some of Godiva’s Pumpkin Spice coffe and I’m sure it would be amazing with a little extra of your syrup in it and whipped cream…I can’t wait! Thanks for sharing. I’m definitely making this pumpkin spice syrup! What a wonderful and creative idea especially since I just spent over $5 this morning for my Pumpkin Spice Latte from Starbucks! So thankful I decided to stop by foodgawker tonight! My hubby just asked me to create homemade pumpkin spice lattes this week! (Not b/c HE loves them, b/c his blood pressure rises watching the increase in Starbucks debits this time of year!) Thank you so much for sharing!!! This looks fantastic! Pumpkin Spice Latte is my all time favourite, but they don’t serve it down here in Australia. I think your recipe is the next best thing, though 🙂 Thanks for posting! YEEESSS!!! YES! YES! YES! HA! I will try this tomorrow. It’s 10:20 pm and everything around me is closed. I must make this ASAP. Pumpkin spice is my favorite! I made this last night,it is so great! Tastes just like it!!! i have to try this! i’m a crazy pumpkin hoarder and not afraid to admit it. ha! last year i bought like 12 cans and used half and saved the rest…so now when it’s not in many stores yet i can be baking pumpkin galore! yum! These pictures are gorgeous! So “fall-y” and festive! I need a pumpkin spice latte now! A homemade version of pumpkin spice lattes? Yes, please! The pictures are gorgeous! As I posted in your facebook page… this latte is amazing!!! I made it for my husband yesterday as a surprise… now I wonder why he refuses to drink plain coffee! By the way, do you think this syrup version would work as a base for the “ginger latte” (Christmas). Would you replace the pumpkin puree with fresh ginger? I bet it would be a good starting point since it’s “just” a flavored simple syrup. But I’ve never had their ginger latte so I’ll have to be on the look out for it later this year! I made this syrup last night and prepared our lattes this morning. Tastes just like Starbucks and I didn’t even have to get out of my pajamas to enjoy it! Thank you so much for sharing!!! Just made it! Tastes better then the coffee shop down the street! Thank you for sharing! Can I just say THANK YOU! I live outside of the US and when I found out that the Starbucks out here don’t serve the PSL, I was so disappointed (not to mention it was all I could think of for about two weeks!). I’ve been scouring the Internet looking for a great recipe for a homemade version and this one is the best. You’ve saved my life (or maybe just my sanity, but both are great to have :). this is awesome. it’s so good its better than starbucks! I realize I’m almost TWO weeks behind, but I still wanted to stop by and let you know that you are WONDERFUL for sharing this recipe. The pumpkin spice latte is my absolute favorite drink at Starbucks, so to think it’s as easy as this at home is wonderful! I made pumpkin cinnamon rolls with a caramel drizzle for breakfast and was wondering how to use up the leftover pumpkin puree… problem solved and breakfast just became way more delicious. Thanks! Thanks a bunch for posting this. I was looking for a recipe similar to Starbuck’s and this is it! I made this last night! I don’t have a fine mesh strainer (or cheesecloth), so I tried a coffee filter but that didn’t work too well…I then tried a single sheet of paper towel (placed into a regular strainer) and that worked just fine. Perfection! I can’t wait to go home and make one for my boyfriend and me! I left it sitting on the counter, though…oops, guess I have to put that in the fridge when I get home! I thank you..truly: It is Thanksgiving weekend here in Canada..I thank you! Do you use a coffee maker if you are are not using the espresso machine? Just make it extremely strong? I cannot wait to try this. I am a Starbuck’s junkie only during this time of year too. (Of course I am pretty fond of Dairy Queen this month with pumpkin pie blizzard, too, haa). Thanks! A coworker tipped me to this recipe. It looks so simple and yummy that I hate for the rest of my pumpkin to go to waste in the can. I am going to make a batch times TEN and share with family and friends. I love cool mornings and hot yummy coffee. And gourmet taste on a homecooked budget is always the best way! Thank you for sharing! I just tried this recipe and I am in heaven!! It is amazingly good. I used sucanat for sweetener and almond milk for the latte. I put enough coffee grounds in my machine to make a whole pot but only put in enough water to make 6 cups so I got a nice strong coffee. OH MY! Definitely easy and cheap! Thank you for putting this out there for all of us coffee lovers who hate paying $5 a cup! Just made this… Yum! Can i say i think its better than Starbucks!? I didnt strain it though, will have to borrow my moms later but made a drink as is and its wonderful!! Thanks!! This was wonderful. I used your recipe and changed it up just a little to make a frozen latte. It turned out great! Thank you! It’s wonderful and a tenth of the cost of Starbys! So its October and still in the lower to mix 90’s here in the Mojave desert….so I cranked the AC up to 65, made this from some homemade pie goop…and VOILA! I officially don’t care that there’s no Starbucks nearby….YAY! Thank you so much for this wonderful recipe. Fantastic recipe!! I made it this afternoon with fresh pumpkin puree made from the pumpkin we had roasted yesterday. For those people who like a little more of a pumpkin flavor, I would recommend adding more puree, but other than that, it was superb. Thank you for posting this! I will be making many more lattes in the future. Made the syrup a week ago, and have been enjoying pumpkin spice latte everyday since! I like this recipe better than Starbucks, and I love that I can make it at home with my almond milk (instead of soy milk, which creeps me out)! I used fresh pumpkin from my garden. Instead of white sugar, I used raw and brown sugar. Add a little espresso from my stove top espresso maker, and voila! Perfect! Thanks for the easy recipe! I just featured this post on my blog! I don’t really see why not. If you do it in bulk, it’s going to separate as it freezes/thaws and will probably just need a really, really good shake after thawing. Individual 2-Tbsp cubes might be a great solution, too. In this tough economy, Starbucks was one of the many things cut from the budget ages ago . I still miss the holiday drinks and I’m so glad I came across your recipe. I have a jar of this sitting in my fridge just waiting for the morning. Thank you. I am so going to try this! I love that you strained the syrup. Spices floating in my coffee kinda gets on my nerves. The last time I used pumpkin, the recipe only called for asmall amoung of pumpkin, so I divided the rest into 1 tbsp portions in an icecube tray, and froze. Glad I did , savinf me a trip to the store this afternoon in order to try this yummy sounding treat! Thanks for the recipe! I made this this weekend. Oh, so yummy! I’m sharing on my Pork Chop Tuesday facebook page. I just bought one from STarbucks. I must say yours looks better! Can’t wait to go home and make it. I love this!! Just shared the link on my facebook because it is SO delicious. This looks great! Do you think it could be canned? I’m looking for a way to send a syrup to someone I know who’s stationed overseas with no access to a Starbucks. It would make her day. It can’t. Have you seen the new Starbucks Via? They make an “instant” pumpkin spice latte that’s just mixed with milk. I made this last night, but unfortunately it wouldn’t strain. I used 1 tbsp. of cinnamon instead of cinnamon sticks. I made this syrup the exact same way last year (and left a comment) and it worked just fine using a single sheet of paper towel. Really not sure what happened this time around. I was super frustrated…and still disappointed. I guess I’ll use cinnamon sticks in the future. Suggestions on how to fix this issue? Did I let it cook too long (5 mins.) and it became too thick…or what? Bummer. I’d probably blame the paper towel. Do you have something thinner you can use? Maybe a coffee filter or some layered cheesecloth – something to catch most of the solids? Can you thin it with enough water (maybe just a couple Tbsp) to be drippable through the paper towel? Thanks for the suggestion! I’ll give it a try tomorrow–I didn’t dare toss it out! :o) I tried a coffee filter last night and that didn’t work either. I’ll try it again with the thinner version tomorrow. I had the same issue as Francesca, I used a coffee strainer and i was left with a chunky syrup. I tried thinning the syrup and straining, but that still didn’t work. I decided to just blend it up in the blender to make the spice bits a little smaller. Since I added water (about 5 tbsp.) it was definitely less potent, so I threw a cinnamon stick in and left it there. Perhaps we’ll give it a try this evening. Like I said, will try with just cinnamon sticks next time. Loved this syrup the first time I made it…this time was as huge bummer! !